Win Trillions is one of the world's biggest lottery websites. You can play many different lotteries from around the world on this site as part of a syndicate. There is over £300 million in prizes to be won each and every week. At this time they they are offering a special promotion where you can get 100 chances to win the EuroMillions for just £1. That's a massive 90% off the standard price. Win Trillions is one of the world’s biggest lottery websites. You can play many different lotteries from around the world on this site as part of a syndicate. There is over £300 million in prizes to be won each and every week. Since launching in 2005 the site has paid out over 190,000 winners. 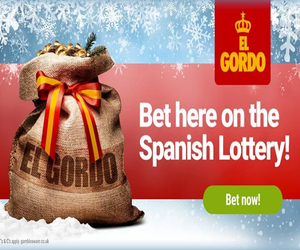 Some of the worldwide lotteries that you can play here include the USA Megamillions, Florida’s Lotto, Europe’s Euro Millions, the Euro Jackpot, Australia’s Oz Lotto, Irish Lotto, Spain’s Primitiva, Italy’s SuperEnaLotto and lots more. You can even mix two draws together and play in their Power Combo where the jackpot is as much as £123 million. Although you need to pay to play in each draw they do offer an excellent VIP loyalty scheme where you can get points after each purchase. Currently, every pound you spend on the site gets you 1 loyalty point. For every 25 points you collect you will get £1 off or if you collect enough points you could get a completely free monthly subscription into a lottery of your choice. Opening / Special Offer: As of 2018 they are offering a special promotion where you can get 100 chances to win the EuroMillions for just £1. That’s a massive 90% off the standard price and more if you were to buy in the shops. To take the offer simply register at WinTrillions via our exclusive link, complete your order and get the discount. You will then get 50 entries to win the EuroMillions each week for 2 weeks. This exclusive offer is only open to new players. Please note that the special discount will be added once you get to the payment page. Syndicate Information: Simply select which draw or combo you want to play in, select how many shares you want and how many months you would like to play for. Each lottery is different and offers different prizes per syndicate, however, the more shares you buy the more you can win. If your syndicate wins then the money will be divided equally between each share. For example, if you owned 5 shares out of a 20 share game and your syndicate wins then you would get a quarter of the total winnings. Full information about the price, the number of shares per draw and other questions can be found at the bottom of the draw information. Payment Options: Pretty much any payment method is accepted including all major debit/credit cards, Cheque, EntroPay, Paypal, Skrill, AstroPay, Ukash and lots more. Winnings: Any winnings up to £500 will be divided and sent to you via cheque or postal order. If you win any amount over £500 you will receive a cheque, get the money through your bank or have it credited to your credit/debit card if you used one to fund your original transaction. – Play the Power Combo to win £167 million risk-free. If you don’t win then your subscription is refunded! I WOULD LIKE TO PLAY&WIN.